The Sisters were always full of surprises, so it’s fitting that these posthumous delights should keep surfacing. And I know there are more to come — a splendid book and a remarkable documentary film! I like this. And I “like” it, too. Here’s the good news from Kyla Titus — enough to make anyone want to shuffle off to Facebook. The Boswell Sisters.com* is now on Facebook. Please like us, and please suggest your family friends like us too by forwarding this announcement! Click here. We are also on Twitter for those of you that tweet…please follow us there as well: https://twitter.com/thesistasdotcom. And be sure to check out January’s featured article Remembering Vet by David W. McCain. *Welcome! to the newest website dedicated to honoring the music, lives, and times of the world’s foremost harmonists, The Boswell Sisters! ** I would be honored if you would find the time to peruse the pages, offer comments and suggestions, partake in the blog, and please do sign the guestbook or fill out the contact form at the bottom of the home page. You may also wish to subscribe to the site via a feed reader, so you can be aware of any new postings/responses to the blog. And please feel free to forward this email to your contacts! 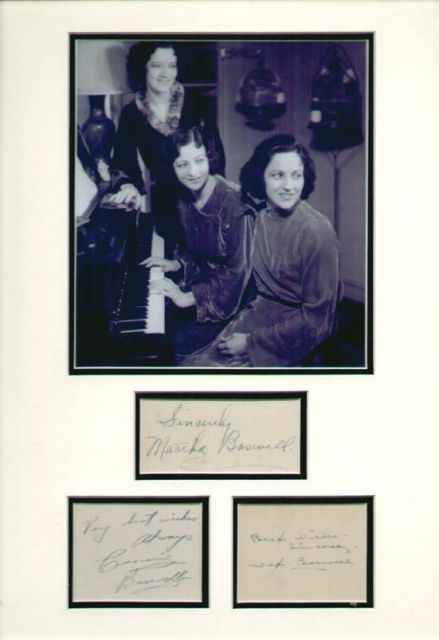 Thank you for your interest and I hope you enjoy the site, but more importantly, I hope you enjoy The Boswell Sisters timeless and extraordinary music! You can write to Kyla here. She knows what she’s talking about: she is Vet Boswell’s granddaughter. **”Who were The Boswell Sisters? They were three extraordinarily gifted musicians who emerged from the wellspring of the jazz movement in New Orleans in the early part of the 20th-century. They were icons, pioneers in music and early radio with influences that extend far beyond their own time. As Maxene Andrews once said, “They took the idea of jazz and did it vocally.” And they did it with such blending and precision that it has never been equaled since. Widely imitated around the world, they are musician’s musicians, and list of those who were influenced by them and their style is very long indeed. If you enjoy vocal groups in particular, or popular music in general, then you owe a great deal of tribute to The Boswell Sisters. And even if you’ve had enough Facebook for the moment, don’t pass this page by — it has the most beautiful (previously unseen) photographs of the Sisters . . . and more to come. Posted in "Thanks A Million", Bliss!, Generosities, Hotter Than That, Irreplaceable, Jazz Titans, Jazz Worth Reading, Pay Attention!, Swing You Cats!, The Heroes Among Us, The Real Thing, The Things We Love, Wow! I’VE GOT SIXPENCE . 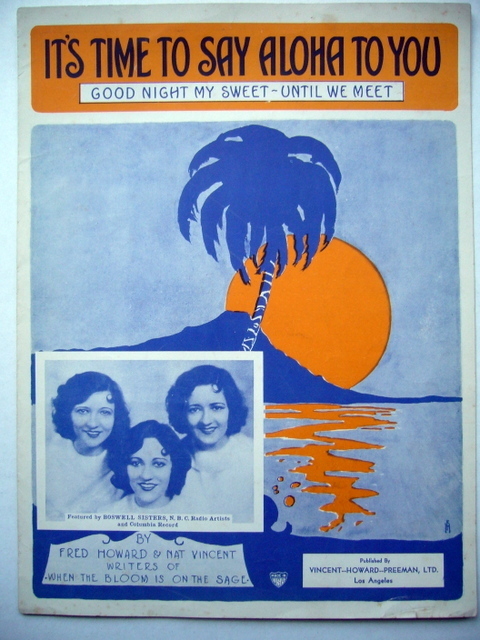 . .
but I’d rather hear the Boswell Sisters sing this song. Here’s a lovely souvenir of their 1935 visit to the United Kingdom. Thank you, eBay! And when I grow too old to dream — I hope this doesn’t happen — I’ll still remember Connie, Vet, and Martha. I promise. On one of my rare audio visits to National Public Radio, I learned of an esteemed auction house that deals in the rarest paper documents — PROFILES IN HISTORY. They are currently auctioning off the treasures of an American collector whose specialty was “everyday life” of the greatest mortals: thus, letters written by people whom we revere for their art — but letters that show them at home, being thankful, ordering a new pair of eyeglasses, listening to the radio. Immortals being mortal, perhaps. The trove is astonishing and the catalogue is no less so. Below I have copied excerpts from two pieces of paper that I know JAZZ LIVES readers will find uplifting and sad, respectively. The first — hooray! has Louis listening to the radio . . . writing happily about the Boswell Sisters. 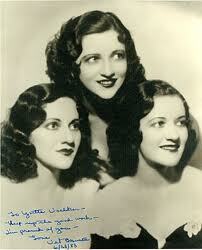 (God bless the Boswell Sisters. God bless Connee, Vet, and Martha, and their family. And that is not a digression.) And he delights in the 1933 Ellington Orchestra. 216. Armstrong, Louis. Autograph letter signed (“Louis Satchmo Armstrong”), 5 pages, (11 x 8 ½ in. ; 279 x 216 mm. ), “Chicago,” 5 April 1933 to an unidentified friend “Gate”; soiled, small splits at folds. I’ve just gotten back home from my Tour down South – we had a lovely time. Everybody was so glad to see me and- you know? – all the ‘Buh lony’ that goes along with it. Ha. Ha. But sho ‘nuff Gate I am having a grand time on my tours. I am now sitting home in my dining room with some of the folks at home and we are listening to the Radio. A swell program is now in session. The Three Keys are now getting away ‘righteously’. Late that Cats are after the Mills Brothers own hearts. But I am still Crazy over those Boswell Sisters. Bless their hearts. They are from my home town, you know? Fine Girls. They think I am the Last word. They played here at the Chicago Theatre the same week we played the Palace Theatre. Ol Amos ‘N’ Andy’s just comin in on the radio. They are still funny. They ‘ll soon be making another movie so you all’l get another chance to see the funny boys again. Like Em? I bet your little boy does. Boy, you’re right, when you said we broke all records for doubling from the Trocadero – to the Hobborn Empire Theatres. Some quick connections I really mean. Ha. Ha. We was known to make time, Eh? Gizzard? Ha. Ha. The second letter is as tragic as the first is sunny: Billie Holiday to her then-husband Joe Guy, while they were both in different jails. What can one say for sorrow? 226. Holiday, Billie (Eleanora Fagan). Poignant autograph letter signed (“Lady Billie Holiday”), in pencil, 2 pages (10 ¼ x 8 in. ; 260 x 203 mm. ), Box No. PMB A, “Alderson, West Virginia,” 12 July 1947 to her husband, Joseph Guy, 10 Reed St., County Prison, Philadelphia, Pennsylvania; the letter is stamped “CENSORED BY:” (and initialed) at the top of page one. Your letter just arrived and it just makes me sick the way people set there sevls [their selves] up to be so true blue. Bama [trumpeter Carl “Bama” Warwick] has told everybody on the street he gave you money a darlor [dollar] indeed could he spare it. As for Bobby [pianist Bobby Tucker] I am sure he will send you some when he can. He said he had to wait until pay day and as you know sweetheart he has got a wife and two kids. But hasn’t he wrote to you yet. He owes me a letter also. Well hes working on 52 nd st and has to travel way over to Jersey. But I don’t think he will let us down. We are going to the Movies tonight so I will finish this when I get back. Well baby I am back from the Movies it was called Sister Kennedy [Sister Kenny, 1946] with Rosland Russel [Rosalind Russell]. It was a very good picture but it made me kind of sad thinking about the last show we seen together odd man out [“Odd Man Out”, 1947] rember [remember] I shall never forget darling its lights out now so I will finish this in the morning. I am going to try so hard to dream of you. Don’t laugh. Sometimes I am lucky and can there goes the lights Well darling its night again. After I got thru [through] my work today I just couldn’t write. I cried for the first time. Oh darling I love you so much I am so sorry you have to stay there in Phila. It must be awfully hot. Yes baby I gained nine pounds and I am getting biger all the time gee you wont love me fat (smile) But you must look wonderful. Youer [you are] so tall and you needed some weight. So thank heavens for that and what ever happens at your trial sweetheart keep your chin up don’t let nothing get you down. It won’t be long before were together agian [again]. My lights has been out every [ever] since I last saw you. But they will go on agian for us all over the world. Write to me Joe as soon as you can. Ill always love you as ever your Lady Billie Holiday. Visit PROFILES IN HISTORY even if you don’t have thousands of dollars to spend on holiday gifts. The letters are frankly astonishing, and the catalogue puts Eubie Blake next to Johannes Brahms, so someone knows where One is.